Aubrey Williams (1926-1990) was born in Georgetown, Guyana in 1926, and began painting and drawing from the age of five. He joined the Working People’s Art Class whilst still at school, studying under E. R. Burrowes, a man he credited as ‘opening the Guyanese eyes to art’. A trained agronomist, his work took him to the north-west rainforest of Guyana, where he lived for two years amongst the indigenous Warrau people, a period which proved one of the most formative of his life and where, he said, “I started to understand what art really is”. By 1952, when he returned to Georgetown at the age of twenty-six, Guyana was nearing the end of its time as a British colony and Williams sailed to London, initially on six months paid leave, to become a painter and began life drawing at St Martins School of Art. As a painter with detailed knowledge of flora and fauna, with personal experience of momentous political change, and with a growing interest in pre-Columbian cultures, he arrived in London with a unique visual and intellectual vocabulary. Over the following years he took the opportunity to travel extensively around Europe, returning to London and to opportunities to exhibit his work. He was also part of the spectacular explosion of creativity, optimism and productivity generated by the influx of Caribbean writers, artists and intellectuals to London at the time. This cultural foment was exemplified in the Caribbean Artists Movement, founded in 1966 by Kamau Brathwaite, poet and historian, John La Rose, poet and activist, and Andrew Salkey, novelist and journalist. Aubrey Williams was a founder member and participated fully in CAM’s activities, as did Ronald Moody, sculptor. Within this mutually supportive network, Williams found, and contributed to, an enriching framework of ideas and discussion, including debates on visual sources, strategies for change, and the stifling effects of being categorised as either a quintessentially Caribbean or British artist. From the early 1960s, Williams exhibited widely, winning awards and garnering high acclaim from a London art circuit enchanted by what Guy Brett calls “the heady interface between artistic innovation and trans-nationalism”. When he had arrived, London was a city with few apparent signs of black presence, and as such, the visibility of Williams’ work represented one of the first challenges to the white dominance in the British art establishment. Over the years that followed however, Williams found himself increasingly confronted by ‘institutional indifference’, his work framed and discussed solely in terms of ‘otherness’. Williams’ paintings have always resisted classification, evolving through many distinct phases over the course of his career. 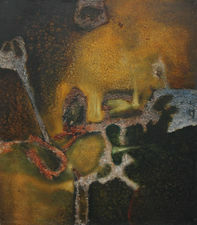 From immaculately accomplished depictions of birds, to figurations, to explosive, vibrant abstracts, Williams drew influence from abstract expressionism, from Olmec, Maya, and Warrau imagery, from science fiction, from the symphonies and quartets of Russian composer Dimitri Shostakovich, and from artists such as Jackson Pollock, Arshile Gorky, Diego Rivera, Yves Klein and Rufino Tamayo.